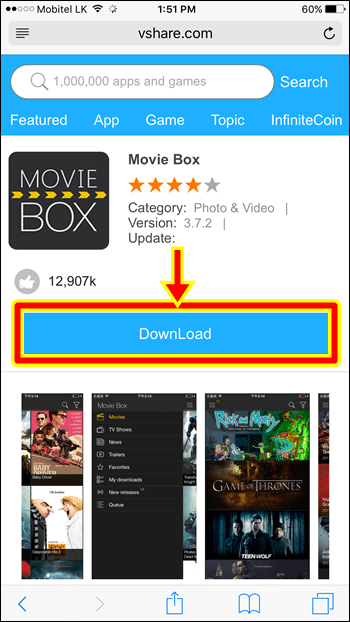 These are the instructions to download Movie Box on iOS devices using vShare (vShare store). 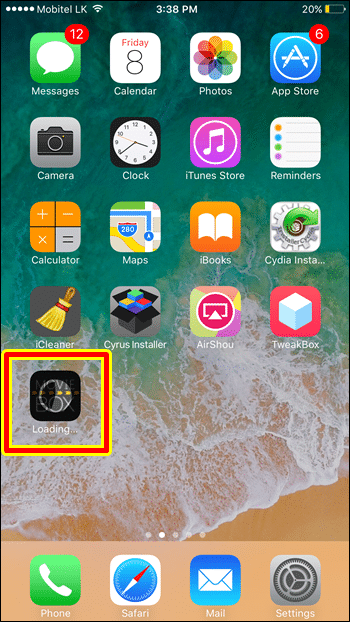 This method can apply for any iPhone, iPad running on iOS 7, 8, 9, 10, 11, 11.4.1, iOS 12 up to iOS 12.0.1 latest version without jailbreak & No computer. Here’s what you know about vShare MovieBox download. vShare is the best App Store alternative for iOS which provides 3rd-party or paid apps for free install / side-load your device. You can Download vShare without jailbreak your iPhone or iPad. 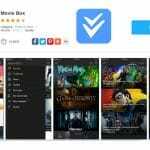 So, we can download Movie Box app also easily with vShare for free. 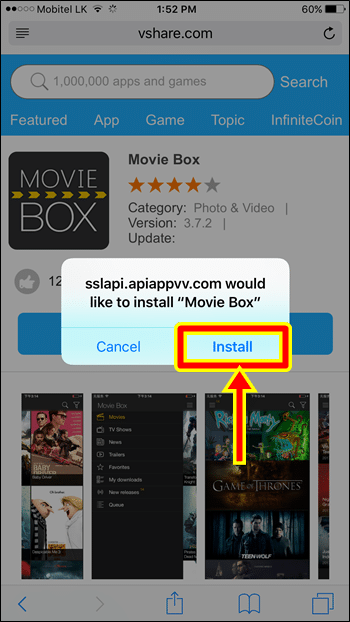 Let see how to download & install MovieBox latest version (Version 4.0.5) directly to your iOS device with No jailbreak. 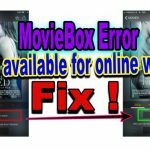 How to download Movie Box on iPhone, iPad using vShare ? Now you can see Moviebox app is downloading & installing on your Home screen. Wait few minutes to successfully complete installation. Go to Settings >> General >> Profiles & device Management & tap on the appropriate developer’s name under “ENTERPRISE APPS” section and trust the certificate. That’s it. 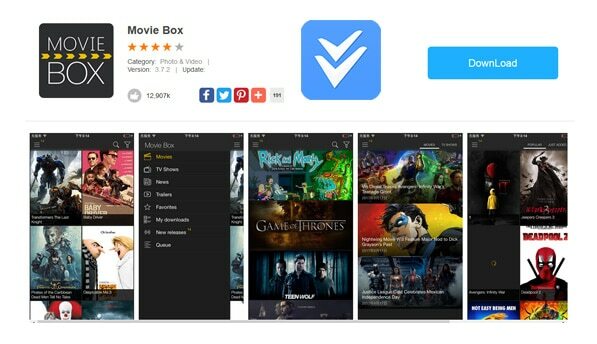 Movie Box app is now ready to launch on your iPhone, iPad Home screen. Just tap on the Movie Box icon & open the app. Find your favorites movie or tv-show to watch online or download directly on your deice. 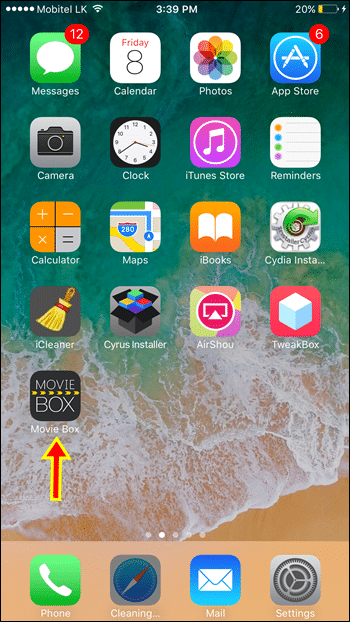 As this, you can successfully installed Movie Box for your iOS devices using Tutu app or any other installer without having jailbreak. 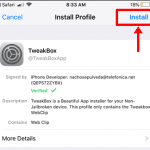 However, apps are sideloaded on iPhone, iPad using 3rd-party installers often get crashed or revoked by Apple. Fortunately, now we have a real solution to stop/prevent sideloaded or hacked apps getting revoked. So, you also can use this method to keep your Movie Box app forever with your device without getting it crashed/revoked. Here’s..
Hi, when I click on Download I get a message that says “can’t connect to sslapi.apppv.com.” Please help. I am unsure why it won’t work.